This record of casualties in the colony has been criticised as only "anecdotal and observatory" by a spokesperson for the company, who says there is no history for comparison. Candobetter.net would say that careful observations from wildlife carers, who know the history of the colony and can point to photographs of corpses and to the animals in their care, cannot and should not be dismissed so easily. If this is the only source of a count on this species, then it is precious and deserves respect. 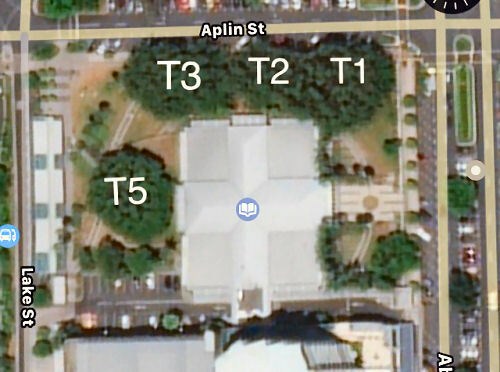 We note that official counts do not monitor the Cairns breeding colonies, which is convenient for the massive development going on there, but needs urgently to be remedied. 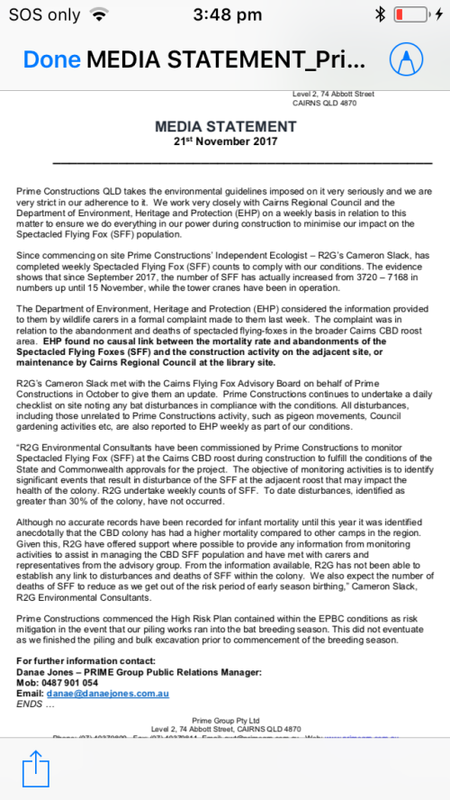 “It would be interesting to know if the Spectacled flying fox conservation status is to be upgraded from this process or whether it was part of the work that the officer Rebecca Koller has had correspondence with, stating that "federal and state governments were working to have the same conservation status for the species". "Fortunately there is a recovery plan for the species and it is internationally protected and recognised, as such this is where we need to focus for the best outcomes. Below is a list of the 8 recovery objectives, if we are able to find proof that these objectives are not being met. It could be possible to proceed legal action." The international obligations are as follows: "The spectacled flying fox is listed under Appendix II of the Convention on International Trade in Endangered Species of Wild Fauna and Flora (CITES). Populations of the spectacled flying fox are recognised as values of the Wet Tropics of Queensland World Heritage Area and therefore under the protection of World Heritage Convention". In this regard we can always contact both CITES and the World Heritage Convention to embarrass the government's into action. 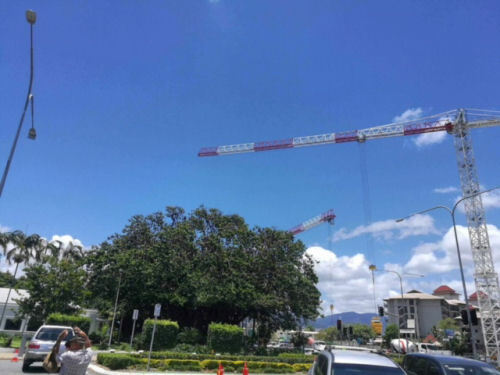 The same could be said of the hotel development who is currently claiming that values of Queensland Wet Tropics World heritage area is damaging their business. 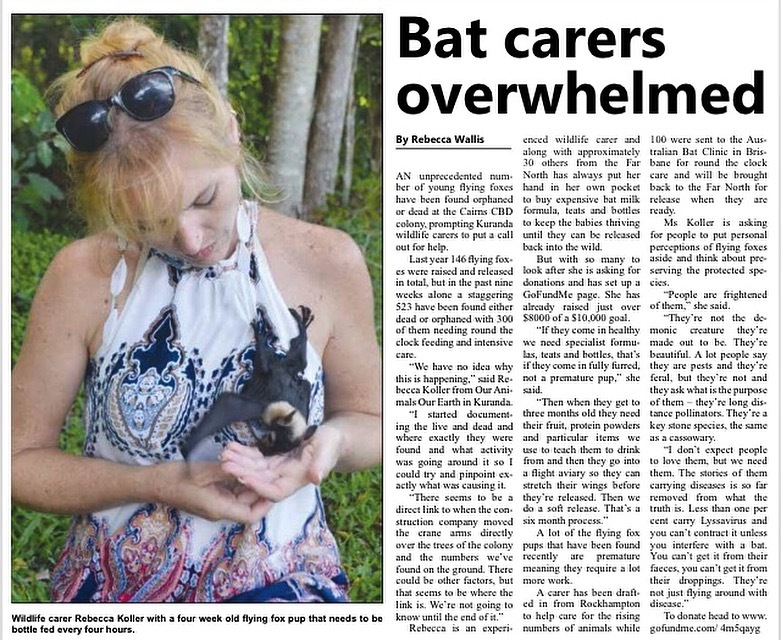 While making a point of this, it would be a great opportunity to advocate for the Spectacled bats ecological and economical services. The link below is the recovery plan for the species which has both the objectives and international matters. This article highlights how shockingly abusive our governments are in turning a blind eye the habitat disruption and destruction. The development it OBVIOUSLY causing havok as bats are noctural and need to sleep during the day. If the trees are deeply vibrating and loud noises are happening it would not surprise me if they are suffering. It's like sleep deprivation. Maybe the development needs to start when awaken at twilight? Pile-driving generally is known to cause MANY problems including damage to nearby properties. So if a big development is going up near you, you need to request that before and after photos be taken of your home, so in the event that the pile-driving causes damage that the developers are forced to pay you for the repair bill. Thanks for that suggestion. We will ask the people mentioned in the article to comment back. [Transcribed by Sheila Newman from an email] "During birthing season I would not think this is a viable option as pups left in trees while mums forage would be distressed. I would encourage construction work to not impact third trimester of pregnancy and birthing seasons, limiting activities that can be done in this period. Cranes swinging directly over the roost trees should be ceased for one as well as cement mixers operating during fly in times where mums return to the roost and reunite with pups, also pile driving activities were under tight restrictions on one site due to the flying foxes but for whatever reason unknown to me they weren’t under restrictions on the other site also across from the colony." Not only on the ground, but in the skies, Australia is becoming more hostile to wildlife, and environments. Koalas are being killed by logging, land-clearing for agriculture and housing, road yet it's labelled as merely "habitat loss" or "deforestation" as if they were natural processes. 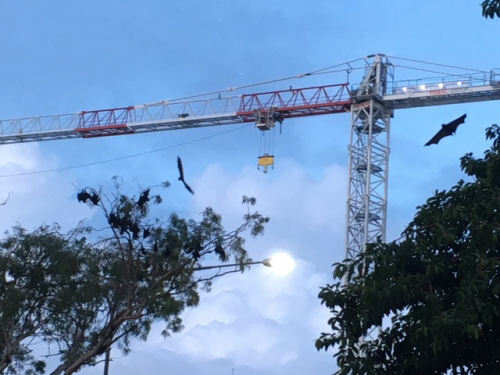 How are these poor flying foxes meant to contend with increasing heat, exacerbated by the heat-island effect and climate change, plus the stress of towers, sky-hooks and cranes? It's an invasion, all driven by heavy population growth that drives demand for towers. Yes, we are being eaten up by market capitalism. Chasing the dollar is survival for those who have to work to pay rent and buy food, but for the power elites who rule us, it has become a kind of addiction. So many very wealthy people are reduced to gambling their wealth for thrills, as if there is nothing else in their lives. The myth of King Midas is so true, yet it appears to have almost no grip in our society. This is a society where the rulers are blind addicts, responding in a kind of reflex arc to any stimulus that looks or sounds like more money. And mass immigration raises the price of everything, and, since they own the resources and assets, they want more and more people.